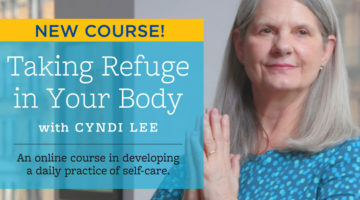 Yoga teacher Cyndi Lee offers a set of movements that open the heart, helping to foster a connection to yourself and the world around you. The summer before my marriage broke up, I cried a lot in yoga class. It didn’t happen until we lay down for final relaxation. Then tears would pour out of the sides of my eyes. It was almost as though I wasn’t crying, but leaking, and it happened every day for the whole summer. Somehow the release of toxins in my muscles and organs during the class also released emotions in my heart and mind. Motion led to emotion. Before the class I had been stuck and yoga unstuck me. It took me on a journey back to myself, and as I embodied my sadness more and more, it began to travel through me and by the end of the summer, I felt clean, balanced and brave enough to make the necessary changes in my life. Even though it was painful, my summer of being heartbroken was better than having no heart at all. To experience the movement of our heart, even if it involves sadness or fear or anger, is how we know we are alive. It is when we don’t experience the circulation of emotions that we get depressed and then get stuck there. The first way to work with this is on the physical level. People know this intuitively, which is why, of all the workshops I conduct around the world, the Heart Opener workshops tend to fill up quickest. I find that so moving, because I feel sure that the people who sign up for those workshops are already open-hearted. However, their supporting anatomy may be tight or weak, making it difficult to feel the physical movement that enables the emotional journey to deepen. Try this: Sit up tall and take a deep breath in and out. Then slouch—tuck your tailbone under and curve your shoulders forward. Now try to breathe deeply. No matter how hard you try, it’s impossible, and the effort is soon disheartening. As your spine droops, your head drops, and your spirit sinks. You can’t see the sky or meet the world head-on. Moreover, the anatomical function of the heart is compromised. It cannot easily receive deoxygenated blood from the veins nor easily pump blood into the lungs, where it gets oxygenated. Why not? Because the functions of the heart and lungs are intimately related and we simply cannot inhale enough air when the cardiovascular department is compressed. This inability to take in oxygen is a subtle form of suffocation and leads to weak “life prana,” or life force, which, according to Ayurvedic medicine, resides in our heart. The Sanskrit word for heart is hridayam, meaning “that which receives, gives and circulates.” We can increase this process of giving, receiving and circulating by strengthening the supportive and protective anatomy around our heart and extending the range of motion in those areas. That includes our arms, ribcage, shoulders, neck, upper back and chest. Let’s try the following vinyasa, or flowing sequence of movements. It will deepen your awareness of these areas and allow your life prana to flow without obstruction. Work gently, mindfully, and rhythmically. I have included breathing guidelines, but it’s fine if you wish to stay in each position for longer than one breath. 1. Begin by standing with your feet about hip distance apart. Clasp your hands together behind your back. (If you can’t reach, you can hold on to a belt or towel.) Try to lift the front of your armpits so your shoulders are not rounding forward. Draw your shoulder blades toward each other and feel broad across the collarbones. Inhale. 2. Exhale and fold your upper body over your legs. Your arms will go over your head, but try to stay open across the chest. Let your head be heavy and your neck long. If you feel any strain on the back of the legs or your back, bend your knees. Over time your muscles will lengthen and you will be able to straighten your legs easily, but in the meantime, work mindfully and don’t even consider pushing your body. 3. 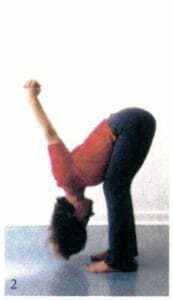 From here, release your arms and place your fingertips on the floor, directly below your shoulders. On an inhale, lift your chest so your spine is parallel to the floor. Feel how the inhalation lifts your heart to this position. Again, bend your knees if that is more comfortable. 4. As you exhale, twist to the right and reach your right arm up to the ceiling. Look up at your hand. If it is in the correct position, it will look as if it’s over your mouth. Feel the right side of your belly spinning up to the sky. Feel a broad line of energy connecting your two hands. 5. Inhale, and return to the flat back position. As you exhale, twist to the other side. Look up and feel the opening in the front of your left armpit/chest area. Inhale and return to flat back. 6. Exhale, and fold over your legs. Hold onto your elbows and let your head drop. Feel your upper body cascading like a waterfall out of your strong legs which are rooted to the earth. Stay here for a few breaths, or as long as you like. 7. When you are ready, on an inhale, begin to round up through your spine. Continue to hold onto your elbows, so that when you are all the way up, your arms will be framing your face. See if you can stand with your arms in this position without letting your front ribs stick out. Relax the whole front of your body and feel it relating to the back of your body. Visualize your warm exhalation moving in a circle around the entire ring of your neck. 8. On your next inhalation, lengthen your arms overhead, and as you exhale, bend to the right. Feel your breath moving into the left side of your rib cage as it fans open like an accordion. 9. Inhale back up to standing and exhale over to the left. Now fill the right side of your ribcage with nourishing breath. Try to keep both arms straight. Press the soles of your feet into the earth. Let your in-breath lift you back up to standing. Repeat this sequence at least four times. Stay connected to the movement of the breath as much as possible by following the path of the breath with your mind. Start to notice where it goes and where it doesn’t. Notice what’s available to you today and how it’s different in each position. On your third and fourth sets, see if you can deepen your breathing slightly, without straining or pushing. Maybe you can and maybe you can’t—it doesn’t matter. Just see what you can learn about yourself. Then practice it again tomorrow and see how it’s different. The main thing is to stay present with the exercise and not get hard in your mind, body or breath. Your body, your shoulders, arms, neck and ribs, can be either a restrictive cage for your heart or an undulating, comforting protector. Well-known yoga teacher Rodney Yee once asked a class, “If you could hold your heart in your hands, how would you hold it?” Ask yourself how you are holding your heart right now: Tightly, tenderly, firmly, gently, carefully, attentively, fearfully, tentatively, easily, joyously? 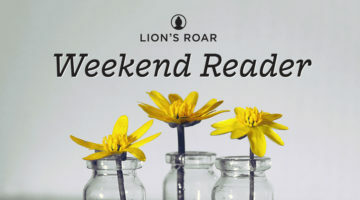 Chögyam Trungpa Rinpoche said, “The way to rule the universe is to expose your heart.” When the ebb and flow of our heart diminishes, we feel separate from the vast world around us, a world in which everything breathes, pulsates, expands and contracts. Yoga, Buddhism and all spiritual paths are a map showing the journey back to the heart of the universe: Big Mind, Great Spirit, the Source of all that is. And the heart of the universe is, of course, always within our own hearts, if only we can be brave enough to feel its movement.